The volume of mobile and online ticketing in both the developed and developing parts of the world is increasing. Online ticketing, along with the increasing adoption of smartphones and tablets, has revolutionized the way consumers purchase e-tickets. Global ticket purchases via mobile and desktop devices -- including smartphones, media tablets and PCs -- are forecast to reach 32 billion by 2019, that's up from an estimated 16.2 billion this year. This represents a two-fold growth over the next 4 years, according to the latest worldwide market study by Juniper Research. The new study found that with digital ticketing services developing fast across the transport and events sector, mobile handsets will account for more than 50 percent of all digital tickets purchased by 2019. Airlines often use their mobile boarding pass facility as a stepping stone to mobile ticket purchase and further mobile service features. Typical examples include seat selection, actual arrival and departure times, flight schedules, mileage summaries, individual booking summaries and especially loyalty programs. The research also found that in almost every market, metro and bus ticketing was being driven by smartphone usage. The low price, high frequency and high volume nature of metro bus ticketing was found to be particularly suited for mobile payments. In addition, it was found that metro bus ticketing is gaining traction through bar-codes delivered via smartphone apps, and through SMS-based solutions -- with the latter witnessing impressive user adoption in European markets such as Sweden and Italy. Juniper observed that ticketing software applications will become key for wearable devices, such as smart watches. "Smart watches with NFC capability offer a convenient replacement for contactless debit-cards and smartphones. Integrating new devices and wearables should be a key strategic directive for all vendors across the ticketing value chain," said Nitin Bhas, principal analyst at Juniper Research. However, the Juniper market assessment notes that a number of challenges, including scanning capabilities and battery life, needs to be addressed for wider adoption. Apple Pay will create a greater awareness of contactless payments via smartphones, resulting in higher adoption and usage of mobile ticketing. 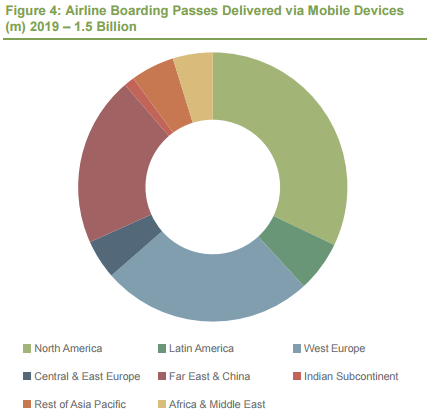 One third of airline boarding passes will be issued via mobile devices by 2019.